The electrical system serves as the nervous system of a space science instrument. The electrical system controls the devices that help collect the information, takes data in the form of physical analog measurements—for example, light levels, and temperatures— and sends the information to a central “brain.” The central depository processes, formats, and transmits the information as a digital signal to a ground station on Earth. The team of electrical engineers at LASP comprises a wide range of technical experience, including digital, analog, and systems engineering. Systems engineers see the big picture, often developed through interaction with a scientist who is seeking a particular type of data, and ensure that all mission requirements are met as the design evolves from the initial prototype phase all the way through to the final flight design. Digital and analog experts work together to ensure that the physical measurements desired by the scientists are collected, converted, and transmitted accurately and that as much flexibility as possible is built in to the measurement systems, so that they may be adjusted if needed, in flight, in response to the observations. 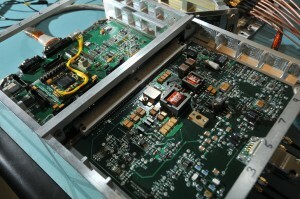 Our technical capabilities include design of detector interfaces and subsystems–including low-noise, high-resolution sensor interfaces; low-voltage and high-voltage power supply design; digital-to-analog conversion; design of embedded digital logic and microprocessors; design of system-on-chip (SOC) logic using field-programmable gate arrays (FPGAs), digital signal processing, and testing of electrical systems to verify functionality. We also offer designer-independent FPGA verification, allowing us to designate one engineer to design the system, and a second to independently verify its functionality. LASP also has developed a mixed-signal, radiation hard by design (RHBD) CMOS ASIC. An instrument is only as good as the parts that it is built from; parts on a science instrument must individually last as long as the mission is designed to last. Parts engineering at LASP ensures that the electrical, electromechanical, and electronic parts of an instrument meet program and Institute of Electrical and Electronics Engineers (IEEE) requirements during development. For example, if LASP parts engineers determine that a necessary circuit on an instrument may not last the length of a given mission, they work with the electrical and mechanical engineers to re-engineer the circuit to improve the circuit lifetime. This improvement could include the use of substitute parts, redundant circuitry, or radiation shielding. Acquiring tested, qualified, and stringently documented electrical parts for use in our instrument development is an important capability at LASP. LASP flight procurement expeditors are experts in preparing procurement documentation that detail requirements for qualified vendors that supply parts. Electrical parts information is compared to data in the Government Information and Data Exchange Program (GIDEP) to help guarantee a successful mission.